Joe Flacco is an American football quarterback who currently plays for the Baltimore Ravens in the National Football League (NFL). Before that, he had played college football in Pittsburg then in Delaware and got immediately picked by the Baltimore Ravens in the 2008 NFL first-round Draft. He has had a fast-paced and successful career and is a fan favorite for fans of the game and the Baltimore Ravens in particular. Here is all there is to know about him, his family and financial status. Joe Flacco was born on the 16th of January 1985 and was given the full name of Joseph Vincent Flacco. His family lived at the time in Audobon, New Jersey, and Joe went to Audobon High School where he unleashed his sportiness playing baseball, football, and basketball. He was the starting quarterback for the school’s football team called Green Wave and was subsequently listed at the number 39 spot for quarterback prospects in their class of 2003. When Joe Flacco was a freshman he was a part of the Pittsburgh Panthers football team. He was named the backup quarterback by 2004. As a backup, he did not play very much and finished the season with only 11 yards completed. He transferred to Delaware in 2006 and was then able to play full time for the Fightin’ Blue Hens. He proved to be so valuable to the school, setting over 20 new school records and the school to show their appreciation added a poster of him in their stadium. While Joe Flacco was at Delaware he had been skeptical about his chances of being drafted to play in the NFL and even asked his coach if he could play baseball. His coach’s belief in him and his subsequent solid showing at the NFL Combine and Senior Bowl helped him become a top-five quarterback in the 2008 NFL Draft. When he won the long distance throw competition with a 74-yard throw at the ESPN’s State Farm College Football All-Star Challenge, his position was cemented even more. Officers from Baltimore Ravens attended his workout at the Senior Bowl and were very impressed at his throwing form in both rainy and windy conditions. They were further impressed by his ability at Delaware, which also had poor weather conditions as well as an uncut and unlined field. They felt assured that he would be able to succeed in late-season conditions at Pittsburgh and Cleveland. In the 2008 NFL Draft, Joe Flacco was drafted by the Baltimore Ravens as their 18th overall pick making him the highest drafted player from Delaware. He signed a five-year contract that had a maximum value of $30 million, and $8.75 million guaranteed on the 16th of July 2008. Joe Flacco became a starting quarterback for Baltimore Ravens in 2008 after starter Kyle Boller’s season-ending injury and the illness of Troy Smith. In the season opener against Cincinnati Bengals, he completed 15 of 29 passed for 129 yards and although he threw no touchdowns and no interceptions he had the longest rushing touchdown for a quarterback in the Baltimore Ravens history. The team eventually won the game at 17-10. Since his rookie season, Joe Flacco has remained the starting quarterback for the Baltimore Ravens and was the first rookie quarterback in the entire history of the league to win two road playoff games. He has been the starting quarterback as the Baltimore Ravens have gone on to win the AFC North twice and appear in three AFC Championship games. Joe Flacco was also the starting quarterback when the Baltimore Ravens defeated the San Francisco 49ers and won the Super Bowl XLVII. He was named as the Super Bowl XLVII’s MVP and following the 2012 season, he signed a six-year contract that was worth $120.6 million. Joe Flacco has also established himself as an outstanding performer in the postseason with a career playoff record of 10-5 and also withholding a record for most postseason road victories. He is considered to have one of the strongest arms in the NFL and in 2013 became the highest-paid quarterback in NFL history although he was swiftly surpassed by Matt Ryan and Aaron Rodgers within months. Joe Flacco alongside his Baltimore Ravens contract has also signed a contract with Reebok in 2008, which lasted three years. He was a spokesperson for Pizza Hut in 2009, ending in 2010 and has also endorsed Nike, Haribo and 1st Mariner Bank since January 2013. He also had an endorsement deal with McDonald’s in 2013 to promote the brand’s new menu items called the Mighty Wings. He also teamed up with opendorse to promote the Zynga mobile app called NFL Showdown: Football Manager. In July 2017, Joe Flacco was diagnosed with a back injury and sat out 3-6 weeks of training camp. In a Thursday Night Football game against the Miami Dolphins, he suffered a concussion hit from Kiko Alonso. With all this, Joe Flacco finished the season starting in 16 games and throwing 1,141 yards with a total of 18 touchdowns and 13 interceptions. In 2018, the footballer threw three touchdowns on the 9th of September 2018 and got a passer rating of 121.7 in the blowout against the Buffalo Bills. Joe Flacco is the son of Karen Madden and Steve Flacco. He has four younger brothers named Mike, John, Brian, and Tom. Mike Flacco is a retired baseball player who is now enrolled at the University of New Haven, where he plays football at a tight end. John Flacco is with Stanford Cardinal football as a walk-on reciever, and Tom Flacco played quarterback for two seasons at the Western Michigan University before transferring to Rutgers and then Towson. Joe got married to Dana Flacco in 2011 and the two now have five children. 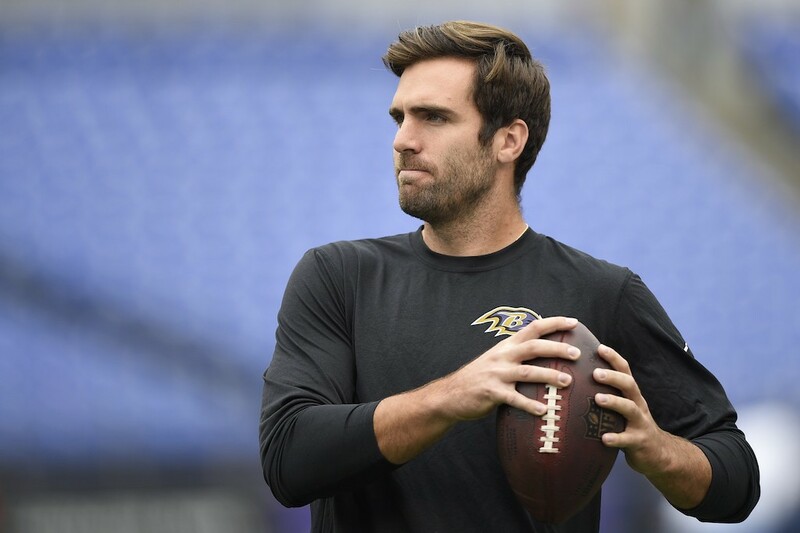 Stephen Flacco their first child was born in June 2012, Danie Flacco came next in September 2013, Francis Flacco was born January 2015, Evelyn Flacco was born September 2016 and their last child, Thomas Flacco, came in April 2018.